“Oh yeah? I’ll show you.” Those were my famous last words. 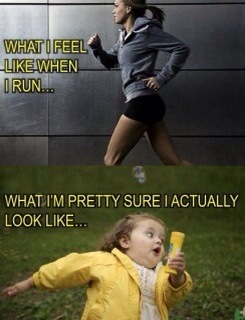 I’ve always claimed I didn’t have the body type to run. Runners are graceful like gazelles, all legs and arms. I’m more of a clydesdale. That was my excuse. I’d never run–I couldn’t. I could do that, I thought. Oh yeah? I’ll show you. Monday found me picking out purple running shoes (for price not vanity, I maintain). I downloaded the ‘Couch to 5K’ app, learned a few stretches, and prepared to bound out the door. “Wish me luck,” I said to my sister. If you’re on the bike paths in town and you hear clumping footsteps and wheezing behind you, fear not–’tis I. I have the grace of a chicken and less endurance. I try to run in privacy so no one sees my cherry-tomato face, but at eight in the evening, every elderly couple, young parent and gaggle of teenage bff’s is on the bike path. I play it cool. THEY don’t know I’ve only been running for two minutes when I blow past them. But in the last quarter of my run, there’s no way to hide how poor of shape I’m in. I grimace like I’m in the last leg of a triathalon. I can’t muster a smile or even gasp out ‘hey’ as I pass. But when the app says “cool down by walking five minutes,” I pump my fist. Every completed run is a victory. Yeah, I want to prove to my family that I can do this. But it’s become more and more about the actual accomplishment. I visualize crossing the finish line and I choke up. And when the app says ‘well done’ I’m thrilled. I think of the Apostle Paul, who said “I do not run like a man running aimlessly… I beat my body and make it my slave so that after I have preached to others, I myself will not myself be disqualified for the prize” (1 Corinthians 9:26). Paul knew what awaited him at the finish line and he’d do anything–he’d “put up with anything rather than hinder the Gospel of Christ”–to obtain that goal. In running I’ve found that mental strength is every bit as important as physical. Self-talk and visualization push me past the pain threshold. Clearly, Paul was a disciplined man who would rather deprive himself of physical happiness than of spiritual gain. But mental strength isn’t enough in times of emotional and spiritual hardship. Then we must tap into the unlimited strength of Jesus. We were designed to exceed our human limits through our relationship with Him. “When I am weak, then I am strong,” said Paul. It was Paul’s relationship with God, ultimately, that allowed him to endure. He endured to the end–his execution–and gained his prize. A big deal compared to my 5K. I’m not expecting this to get easy any time soon. I’m not sure I even like running. But I like the prize, I like how I feel about myself after I run, and I like what it’s teaching me about life. I’ll keep you posted on how the race goes. August 17th is the day! Great post! Good luck on your race! Thanks for reading. The app is called ‘5k runner’. Good read! Enjoy your runs!!! But seriously-yeah, I’ve never enjoyed the process much (more with running). When I realized that I was able to sit cross-legged comfortably because my muscles were limber, something clicked inside of me. I’m not sure why that was a big deal, but it was. I realized something was actually happening to my body.